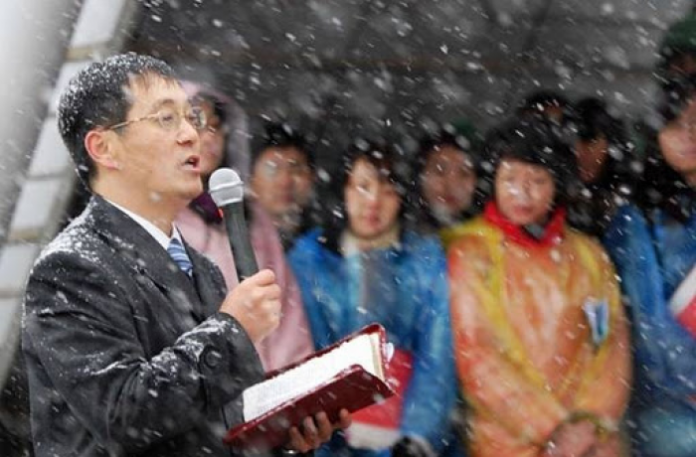 Beijing (AsiaNews/Agencies) – After years of repression, Chinese authorities last Saturday shut down the Shouwang Church, one of Beijing’s largest Protestant congregations for failing to register as a “social organisation”. Government officials also closed down all of the Church’s subsidiary organisations, seized its assets and questioned more than 20 of its members. On the day of the closure, members attending Bible classes affiliated with the Church had planned to meet at 1:00 pm, but authorities took between 20 to 30 of them to a nearby school to question them, took down information from their ID cards, and informed them that the church had been shut down. Despite these claims, Shouwang Church had submitted an application to the Haidian District Ethnic and Religious Affairs Bureau in 2006, but it was rejected on the grounds that its pastor, Jin Tianming (pictured), had not been officially ordained by the state. In China, clergy who do not receive their credentials from the government are not allowed to serve in churches, but many still do in unregistered Churches. According to estimates by Protestant groups, more people are affiliated with underground Churches (80 to 90 million) than with the government-sponsored Three-Self Patriotic Movement (around 20 million). The authorities have targeted the Shouwang Church since it was founded in 1993 by Jin Tianming and his wife. In addition to the confiscation of assets worth millions of dollars, Jin and other Church members have been placed under house arrest. Due to government pressure, some Church members have fled China or given in to government demands. In 2009, the community bought a 1,500 square metre building for its activities, but the authorities have always prevented its use. Since 10 April 2011, the congregation has met in outdoor locations, such as roads and parks, putting its members at risk of arrest.